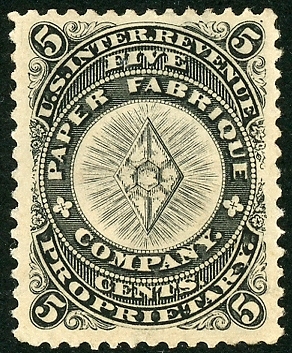 The five-cent Paper Fabrique stamp was issued from June, 1873 up to October of 1880. 1,843,639 copies were issued on silk paper and 2,143,071 on pink or watermarked papers. The copy above was printed on watermarked paper. The Paper Fabrique company was located in Middletown, Ohio. It apparently produced cards unler the label of Eagle Card Company, and may be the source of the Eagle Card Company stamp.